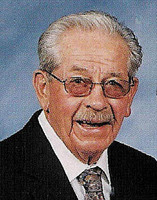 A graduate member of the Tomahawk High School Class of 1941. Roswell "Buck" Nelson was a two-way starter for all four years in football and captain of his boxing team from his sophomore through senior year. In addition to the seven letters he earned, Buck never lost a boxing match during his three years of high school competition. To date, Buck was also part of the most successful high school football program ever assembled at Tomahawk. During the four years, he was a two way starter Tomahawk put together a 19-2-3 record. After high school, Buck went into the service where he served his nation faithfully and returned home to become involved in our schools and community. One of Buck's special accomplishments was opening the first supermarket in Tomahawk in 1955. Showing his determination to remain in our community, when a fire destroyed his supermarket in April 1961, he rebuilt and reopened by Labor Day 1961. Buck was the first president of the Tomahawk Jaycees's, commander of the Tomahawk American Legion, president of the Tomahawk City Council on which he served for 30 years. He was a member of the DAV & VFW, Honorary Order of the Arrow of the Boy Scouts, Wisconsin Grocer of the Year in the early 1990's, and was even encouraged to run for State Senator in the mid 1950's. Truly, Buck's commitment to our community goes well beyond our city limits as his hard work is recognized and appreciated around the state.